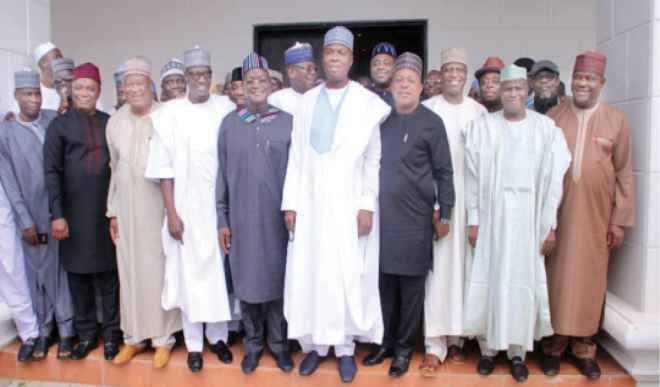 Intrigues ahead of the 2019 elections continued yesterday as Senate President Bukola Saraki, the National Chairman of the Peoples Democratic Party (PDP), Prince Uche Secondus and other high ranking members of the party met in Ilorin, Kwara State. Others at the meeting included former Jigawa State governor and PDP presidential aspirant, Alhaji Sule Lamido; Governors Nyesom Wike (Rivers); Aminu Tambuwal (Sokoto); Samuel Ortom (Benue); Abdulfatah Ahmed (Kwara) and National Publicity Secretary of the PDP Mr. Kola Ologbodiyan. The meeting is seen as further moves by some elements in the ruling All Progressives Congress (APC), who have since formed a splinter group, to return to the opposition party. The meeting came after some of the dignitaries had taken part in the eighth day ‘Fidda’u prayers for Alhaja Aishat, mother of Alhaji Kawu Baraje, who led the formation of R-APC before he re-joined the PDP few days ago. For Secondus, yesterday’s meeting was his second coming to Ilorin in five days. He had earlier visited the Baraje family house on Saturday. “It is a brotherhood meeting. Our leaders met and they shared thoughts on the future of Nigeria and how to improve on the living condition of Nigerians and how to make Nigeria a better place for all to live in. “It was a convergence of notable Nigerians; do not forget that the essence of today was to commiserate with Alhaji Baraje on the death of his mother. When politicians meet, they must discuss politics and how to improve on the standard of living of Nigerians. It will not be wrong to say that some issues were discussed,” he said. On when Saraki would defect, he said, “I do not know when Saraki and Baraje will publicly declare their defection. I cannot speak on that,” he said. Saraki’s media aides also declined to speak on the issue, even as they dismissed speculations that it [the meeting] was meant to perfect the defection plan of the Senate President. Already, Ortom had said that the APC had given him a red card, while Tambuwal is said to be consulting with regards to his expected exit from the APC. Saraki had on his return to Ilorin on Tuesday asked that he should not be rushed on the issue of his speculated plan to defect from the APC. Earlier in the day, Governor Ortom had told journalists that his meeting with the national leadership of the APC would determine his next political move. He, however, explained that the final decision lied with his people who were more important to him. Ortom stated this in Ilorin while speaking with journalists shortly after his visit to the Kwara State Governor, Abdulfatah Ahmed. At the fidda’u prayer, the Grand Mukaddam of Ilorin Emirate, Sheikh Sulaiman Dan Borno, called on believers to be steadfast and do good at all times, saying whatever one did had its rewards. Other dignitaries at the prayers included the Deputy National Chairman of the APC (North), Senator Lawan Shuaib and his Southern counterpart, Niyi Adebayo; Senators Barnabas Gemade, Shaaba Lafiagi, members of the Kwara State House of Assembly, representatives of the Emir of Ilorin, Arewa Youth Consultative Forum, and members of the Kwankwasiyya movement in the state, among others. Credible sources with the ruling APC said yesterday that the likes of Saraki, Speaker of the House of Representatives Yakubu Dogara, Tambuwal and ex-Governor Rabiu Kwankwaso, and many others were all weighing the final options before their departure. One of the sources said, “For now, almost all of them see the PDP as the last resort because it is the only party with what I can call semblance of presence here and there. “But there is a huge problem for many of them; and we all know that politics is local. With the exception of few, many of them would simply meet a worst scenario in PDP in their various states and even at the centre. You see, you cannot eat your cake and have it,” he said. The Chairman of the APC in Sokoto State, Alhaji Isa Sadiq Achida, had on Monday said that there was no reason for Tambuwal to leave the party and that they were not contemplating sacking him because he did nothing to warrant ejection. “We are with him (Tambuwal). There has been nothing incriminating from him, he is with APC 100 per cent; supporting us, giving us everything we need,” he said. Also, the Senior Special Assistant to Governor Ahmed on Media, Dr. Muideen Akorede, also said on Monday that his principal was still a strong member of the party. There were insinuations that Governor Ahmed would follow Saraki to PDP or another party in the coming days, considering that Saraki’s strong ally, Alhaji Kawu Baraje, had jumped ship to the leading opposition party. The National Chairman of the APC, Comrade Adams Oshiomhole, had on July 7 assured President Muhammadu Buhari that the party will be victorious in 2019 without members of R-APC. Oshiomhole who played host to former state chairpersons of the defunct Congress for Progressive Change (CPC), said his leadership had started meeting with members who have genuine grievances. “We listened to Buba Galadima [chairman of the splinter R-APC]. It is as if a very hungry bird is dancing at the centre of the road and a disgruntled drummer not far away in the bush is drumming for him. “But this is not to say that we are not aware that there are challenges here and there, but anything about APC is considered more much more than the sum total of all the challenges we have in many of the states. And by the special grace of God we shall overcome them and we are already overcoming them. “I am very confident that we can afford to ignore Buba Galadima. When we see people who have genuine grievances, we are not ashamed to talk to them. We recognise that democracy is an equaliser and only people who are humble enough to engage can survive and we have been engaging. “We have been meeting with various individuals and groups who we believe really have genuine concerns on certain matters and we are making progress. But when we see people who don’t mean well, there are a lot of idle people who don’t have any other thing to do and once they don’t have access to national honey pot, then they begin to complain,” he said. “Nigerians are wiser, they know that corruption is fighting back, they also know that President Buhari’s resolve to fight corruption must elicit a counter force and that force must find attraction in some people,” Oshiomhole said. On Tuesday, the Deputy National Chairman (North) of the APC, Sen. Lawali Shuaibu met with former Governor of Benue State, George Akume over Governor Ortom’s claim that he was given a red card. A source in the APC told our correspondent that the meeting was deadlocked because the side of Governor Ortom was not heard yet. “We feel some of those who alleged they were marginalized are being disingenuous; what more can you give a Senate president or Speaker? What do you think you can give a governor so that he would be convinced that he is being carried along? I mean, we should be fair to ourselves and may be some of them simply want President Buhari to vacate his seat for them to occupy it. But they can go ahead and challenge him under different platforms; one thing that is certain is that you can only have one president at a time,” he said.